Went to the WTU banquet here last Saturday. Had a good time and won a nice Buck sheath knife in one of the ticket raffles. One of the silent auction items was a Mathews Triax bow. I ogled it a bit and commented to my lovely wife that my old bow, Mathews Outback, was 15 years old and the Triax was quite a jump forward in comparison. It was also a 29” 70# bow which were my measurements. Anyway, we socialized a bit with some other attendees and during the silent auction result portion this appeared at our table. I spent the week setting it up and adding accessories as well as cutting and fletching some new arrows. Can’t wait to start shooting as soon as this most recent snow storm is over. Thought I’d share. Anyone else shooting new equipment? Brudda frum anudda mudda... wow, lucked out! I also shoot a 14 year old Mathews Outback. I've been drooling over that Triax and their even newer Vertix. I've read a lot and seen review videos. That's an awesome compound bow. Probably one of those will be my next bow, but I'd have to win it in a lottery. Their older No Cam bow might even be a better fit for me though. I guess the days of Mathews One Cam technology like on the Outback is over. Bow manufactures have solved the Cam syncing issue. Why feathers and not smaller plastic vanes? Damn , where's the trigger ? Very nice! I have an old Mathews Switchback that is needing a new string and cable. The last time I replaced them I thought perhaps I should have bought a new complete set up for what it cost me. Let us know how you like this bow and how the shorter axle to axle works out for your anchor point. Brad, I shoot feathers because I like a nice right helical spin and they stabilize my fixed blade G5 Stryker broadheads better, for me, than Blazer vanes do. I don't care about how durable vanes are because I basically have a proshop in my basement, complete with press, fletching jigs, arrow cut off saw, digital scale, serving jig, etc. There just aren't any good shops up here to get work done, so I've learned to do it all myself. Granted, I'm not up with the latest tech for the new bows, but essentially the parts are the same. If I ruin some fletching by practice or running the feathers through a deer's ribs, I just scrape them off and re-fletch with new Gateway feathers I have in stock or I order some more online. I did have to buy a new press for this bow from Lancaster Archery, called the Synunm press, because of the big cams and split limbs. I use my old press to hold the bow and act as a safety cage, and the new press to compress the limb tips for string work and peep installation. The Synunm is a kind of pulley system that is slicker than snot to use. I also have found feathers to be a little more forgiving of accidental rest or riser contact. If I had to pay someone else to do all this stuff then I would probably shoot vanes and keep special hunting only arrows set aside. I've been shooting Gold Tip 5575 for years so I have lots of them to work with. CzechSM, My Dad had a Switchback for many years. It is one sweet shooting bow. I replaced the strings for him twice during while he had it. Left handed cousin has it now. I believe we used string and cable sets from 60X. I don't remember how much we paid for them but I enjoyed the time spent with him, setting up the new string and getting the peep to align properly, and getting everything else tuned in. The shorter ATA at 28" shouldn't be a problem, I hope. When I just threw a loop on and tried to shoot it, I did get some nock pinch. To solve that I have installed some soft nocks inside the loop to keep the knots from sliding. Just a couple wraps of serving material tied in, kind of like serving in a peep, keeps the loop from contacting the arrow nock. GunsRus, no trigger on this one except on my release. Someday I may not be able to pull a vertical bow back any more and will have to switch to a crossbow, but not yet. I agree that it is pretty advanced looking for essentially a stick and string, but I still need to do the legwork to get in position for a shot. 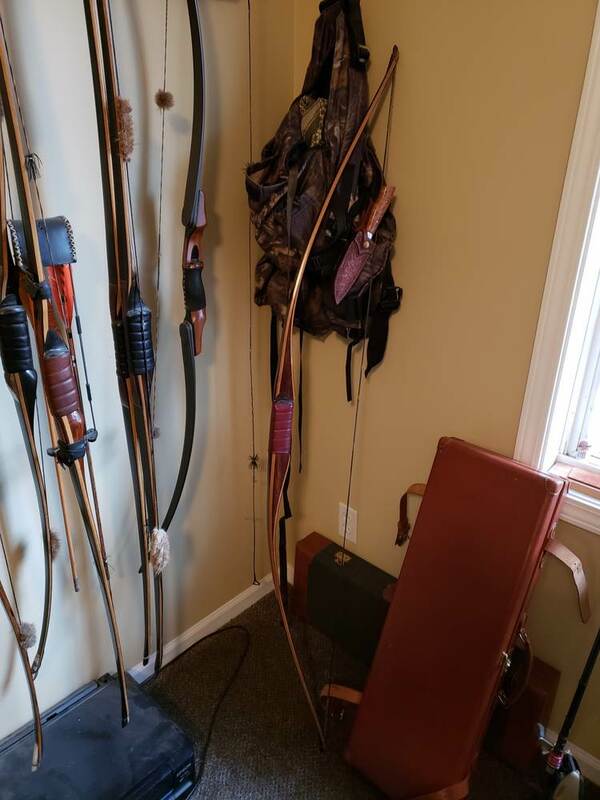 I enjoy archery and have a few recurves and long bows and one self bow I made with Glenn St. Charles when I was stationed out near Seattle. I just enjoy flinging arrows, but when it comes to shooting deer I prefer to be confident and deadly. I also use serving material on the inside of the D-loop to eliminate any nock pinch. I have noticed as the bows get shorter the cams get larger and I am curious about the string angle and how much more acute it is. I believe in a precise draw length and a consistent anchor point to give me the best accuracy, especially shooting down from a tree stand when draw length issues are more pronounced. The shorter draw length bows I have pulled back "seem to" want to feel too long to get my desired anchor which part of my anchor is the tip of my nose. Perhaps a t-handled release would solve that? Interested in your views. I shot back tension releases for years but prefer a trigger for hunting. I didn't factor in the size of the cams. They are pretty large compared to my Outback or Drenalin. Even though the ATA is 28" I'll wager the angle from cam tip to cam tip might alleviate that somewhat. I will have to measure that and see. I do use a G5 Meta peep that opens upon draw vs the old style made for longer bows. I also try to bend from the waist when shooting from an elevated stand, rather than from the shoulder. That keeps the geometry across my back and shoulders the same and doesn't change my draw length. You probably already know that technique though. I once had a Darton Tornado with hatchet cams that almost tore my shoulder out when I lowered my bow arm to shoot rather than bend at the waist. I also use the tip of my nose as another anchor / reference point so it sounds like our shooting styles are similar. Once I get a few hundred arrows launched I will report back if I run into any issues. Did you guys get pounded with this last storm also? My Mom in Wausau got 12 inches of slop there. That's a fancy one for sure. Got another 70 # pull bow if you find that one to easy. It likes arrows with feathers too.It's got history also. Sweet! Don’t think I’m HeMan enough to shoot a 70# trad bow. Not shoot it well anyway. Beautiful collection you have there. Did you put a bid in for it yourself or did your wife sneak one in as a surprise for you Troy? Also, was that Lancaster Archery Supply in PA? It sounds like we shoot with similar style. Years back I shot 3-D competitively and know how crucial form and draw length is for uphill and down hill shooting. Actually sharp uphill shooting really exposes incorrect draw length when using a back tension release. Even though I hunt with a trigger I still use back tension. I'll be curious on what you discover about the string angle/draw length/anchor. Mathews put out a nice product. We did get pounded in the last storm. I have no idea on how much we actually got due to high winds, rain, sleet, snow. As I drove to work at 4:00 a.m. on Thursday and only being able to see 3 feet in front I questioned my loyalty to the company. The weather has put the end to the spring wild bird runs for me and I feel sorry for the kids that will be sitting out in this slop for the youth turkey season this weekend. Yes, my wife snuck in the bid and bought it for me. 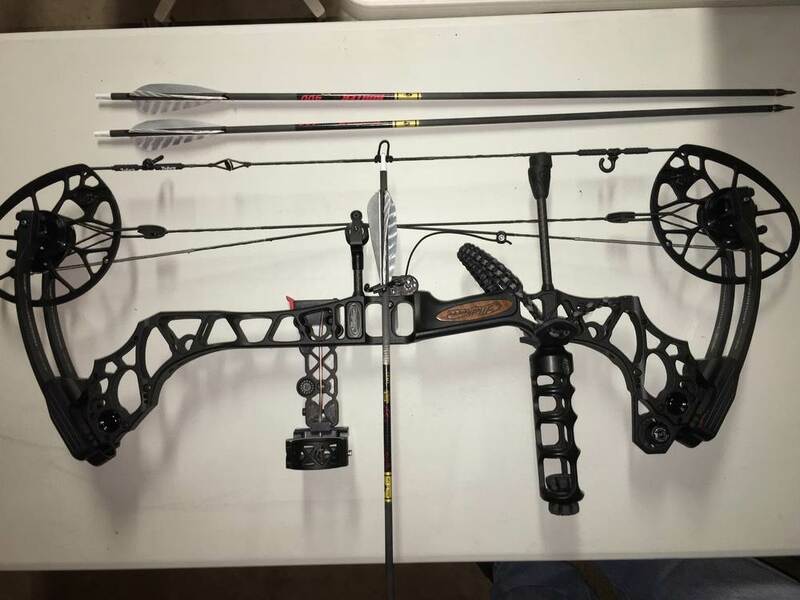 I have been looking at newer bows for a few years, in particular the NoCam, but couldn’t get myself to buy one since I just keep killing deer with my Outback. I don’t practice much with it anymore even because it’s like putting on an old pair of moccasins. I might start a dedicated sub-forum for Trad/Longbow/Recurve Archery and another for Modern/Compound/Crossbow Archery under the deer Hunter main Forum. As mentioned a couple times I was also really interested in the Mathews NO CAM as my last bow. Everything I saw and read looked like that bow would be a good choice for an aging archer with a gimpy right shoulder. Smooth, forgiving etc. I never got the chance to try one and they have become harder to find. Major compound bow manufacturers change their models every year it seems. So much competition. But that Triax and the Verix are supposed to be very smooth as well. I couldn't practice with my Outback practically the whole preseason or in season last fall due to a bad shoulder. But I've been doing light weight work to build it up. I'm gonna try out my shoulder this summer with the Outback and try and get another season out of it. Then it might be a note from my doctor to the MEIF&W to be able to use a crossbow for deer. What a great gal you've got there Troy. Does she have a single sister? I'm willing to relocate, especially if there's good grouse hunting nearby. A friend's father works at LAS, small world.